The phrase "Shining" holds a very different connotation in the gaming space depending on who you ask. Ask an old school RPG fan what it means to them and they would likely mention its previous, tactical role-playing game form of the beloved Shining Force titles. If you were to ask developer Sega themselves, they would likely phrase it in a way that could be just about anything resembling an RPG, especially given the many games they have churned out under its banner. That said, the Shining series has most often shifted toward a more typical action-RPG template in Japan these past couple decades. Though it may be an enhanced release of a formerly Japanese-exclusive PlayStation 3 title, Shining Resonance Refrain should radiate as a curious new direction for the series after a long absence from English speakers specifically. Above nearly all else, Shining Resonance Refrain takes a keen interest in both dragons and music while very rarely separating either element. Everything from the usage of musical armaments (...called "Armonics") to the main character, Yuma, who bears the latent power of a powerful dragon, play pivotal roles in the overarching narrative. That said, ultimately, the story itself rarely boils down to being more than a handful of good guys fighting against an evil empire despite however much jargon it tries to throw at the player like "Diva Magica" or many phrases straight out of Norse mythology. The main story remains predictable to a fault and can be rather hokey in more than a few instances because of it. 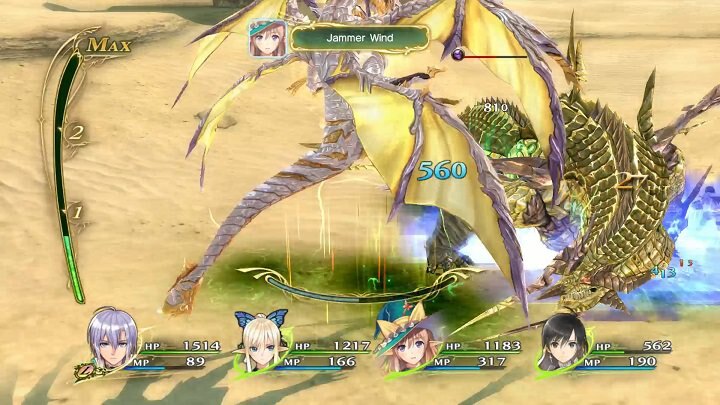 Gameplay-wise, Shining Resonance: Refrain takes more than a few notes from its action-RPG contemporaries (such as Namco's Tales of- series) but with a couple of minor twists. You have your real-time combat system in which normal attacks use a stamina gauge and it quickly becomes encouraged to use special MP skills right before one runs out of stamina to maintain a constant offense. To not so subtlety chime a reminder of the musical setup, there is also a BPM gauge that steadily builds up mid-battle which will provide a variety of buffs upon use depending on the song. Admittedly, battles are rather button-mashy, and quickly become routine, but are also easy to get into. 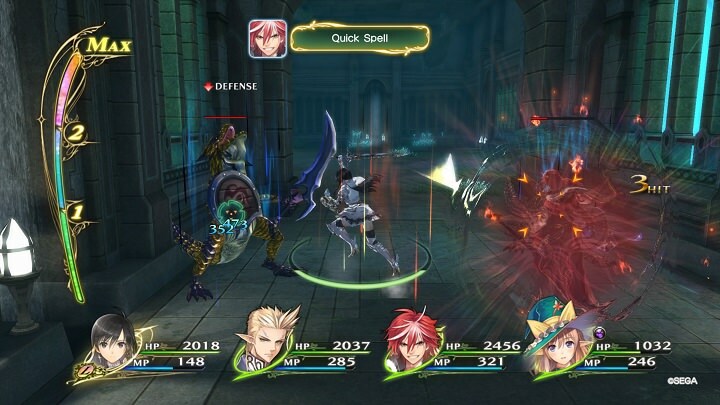 The game also does a decent job at making each party member feel unique, such as the ranged grenadier, Marion, who can use support spells, and even the main character, Yuma, who quickly goes from using a standard longsword to transforming into the Shining Dragon mid-battle. There are more than a few battle system foibles than the simplicity of it, however. Some are amusing like the main character becoming overpowered to the point of trivializing most other attackers by literally only needing to mash the circle button from the halfway point and on. Less amusing, however, are the frequent slowdown for flashier spells and, what can be even more annoying, the sleepy ally AI especially in regards to healing/suicidal positioning. Unlike the frequent slowdown hiccups, thankfully some of the AI problems can get straightened out over time if one messes with 'traits' within the Bond Diagram mechanic, which affects AI tendencies like their increased inclination towards using healing or buffs/debuffs mid-fight. 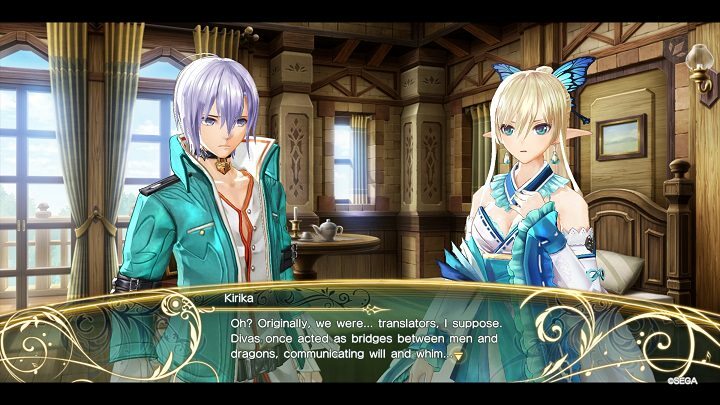 In sharp contrast to their unreliable combat usage, one of the surprising strengths of Shining Resonance Refrain's main playable cast is their likability in a story context. One the most obvious ways to see this is within the primary town, which features numerous interpersonal scenes as well as the opportunity to go on dates with party members (yes, guys included). It is clear that these affinity systems were mostly developed with the pretty lady characters in mind but the actual implementation comes across as far more wholesome than one would expect. In addition, there is a pretty earnest friendship that develops between everyone, and not just Yuma despite, well, the story having more than a few over-the-top anime antics moments in-between. Perhaps the biggest problem with the entire game (yes, even more than the very cliched main story) are the huge discrepancies caused by the level-up progression. Main story bosses spike in level at an absurd rate each chapter, and the means of gaining the experience to close the gap in a reasonable amount of time is quite limited. I had to go out of my way to look into items that made it so inactive party members would gain experience, and to increase the rate of seeing the in-game equivalent to Dragon Quest's Metal Slimes (called eggs) in specific, randomly generated Grimoire dungeons, because the experience obtained from normal enemies in regular environments was way too low (... just like in Dragon Quest). In spite of such glaring gameplay flaws, Shining Resonance Refrain still somehow manages to be better than the sum of its parts in charm alone. One of the key ways it does is in the sharp localization which makes an often predictable script somehow still entertaining to read, especially regarding character specific scenes in the central town. The underlying care also transfers to the audio, like how the instrumentation of BPM songs will change based on which character performs it; a nice touch to an already good soundtrack. Heck, even the English dub is solid as well, though I admit I gravitated towards the Japanese voices due to some top-notch talent and it having a more natural transition towards the Japanese-only vocal songs. Shining Resonance Resonance is one of those strange titles that is significantly flawed in both its gameplay progression and main storytelling yet manages to stumble onto the path of being enjoyable regardless. Its key flaws are quite difficult to ignore, especially if one has a low tolerance towards cliche storytelling (which it is dense with), and it requires a willingness to accept the genre stereotypes it so frequently leans on to see a more sincere, lighthearted underside. If one wants an easy to approach action-RPG that is as charming as it is predictable, Shining Resonance Refrain is a solid option. But those expecting anything deeper in their RPG experience would be much better served looking elsewhere than it. What? Barrel actually kinda liked a game with character designs by a known eroge artist? 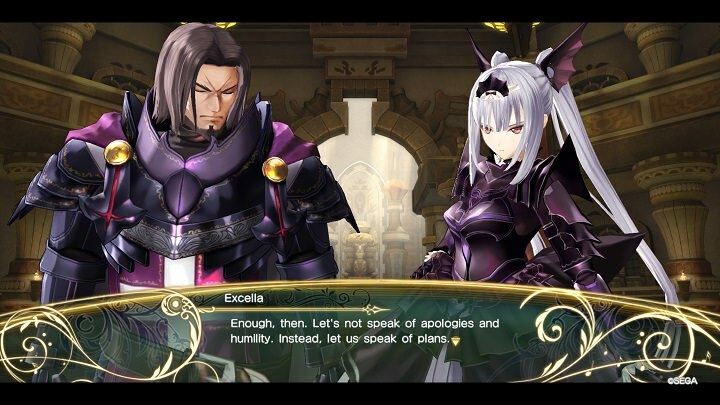 PLEASE DON'T BRING YOUR THIRSTY MINDSET INTO MY WHOLESOME RPG WHERE THE MOST RISQUE THING THEY DO IS HAND HOLDING.